‘sled-esque 5’10 x 20 1/4 x 2 5/8 quad for Pavel Danko in Clare (4+4+tail patch, +4 = 2.85kg). 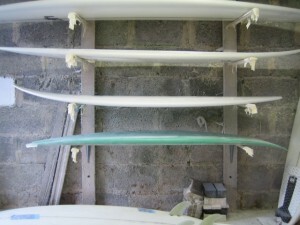 Pavel wanted something short, quick, responsive and easy to catch small clean waves with. He is maybe 5’9 himself and powerful looking. The board borrows a few bits and bobs (!) from the bobsled in terms of quad fin positioning factored down for the reduced tail area and also in terms of bottom contouring. 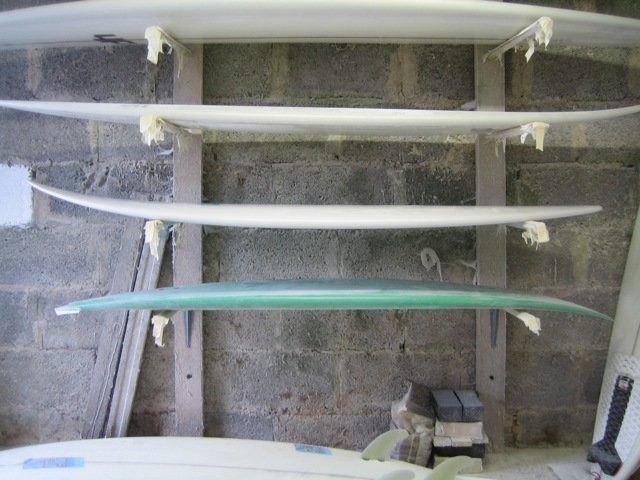 They look a bit odd from certain angles to the ‘thruster trained eye’, but the result is impressive drive and carry where it is needed on different parts of the wave face. I guess one benefit over the bobsled might be that this board isn’t as ‘strange’ looking which definitely has an influence on how a surfer might feel about it. I’m pleased about that, Pavel! Did you sell your other board yet? Get the wax off and send me a shot and dimensions and I can post it up here. Also, have a look at other forums that have classified sections for advertising second hand goods.